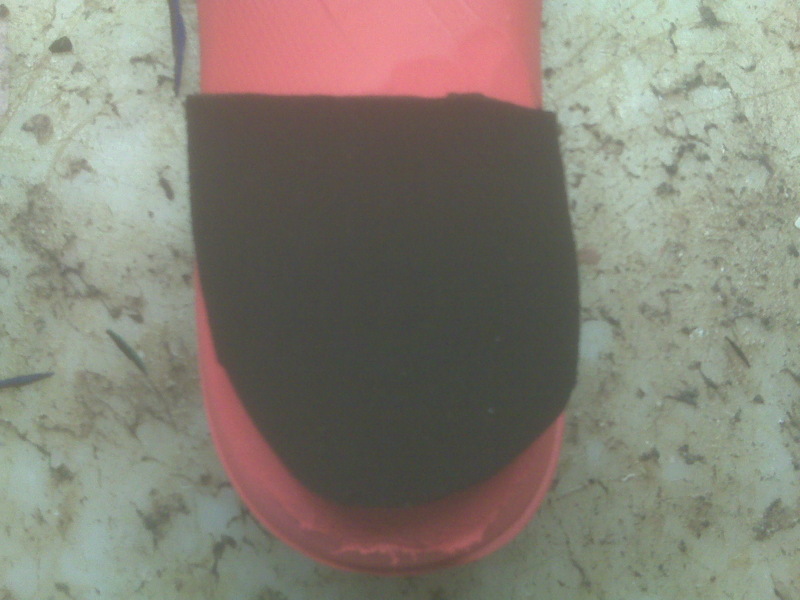 Hapad, Inc. makes a large number of adhesive felt pads which easily attach into the arch of shoes. For shoes that have minimal room for extra stuff, the Hapad support has proved invaluable for my practice over the years. Ballet slippers or high heels are perfect uses of these pads when room is an issue, but for many patients this can be there primary arch support in all their shoes. You can easily order this product from http://www.hapad.com/ or call 1-800-544-2723 to find local distributors. You can also email at info@hapad.com. 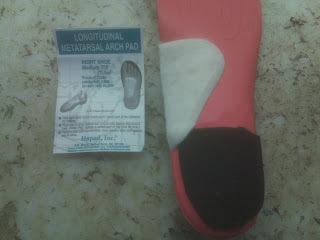 I tend to use two products routinely---the small Longitudinal Metatarsal Arch Pad and the small Metatarsal Pad. Even though they are the small versions, they tend to be very adequate for most instances. 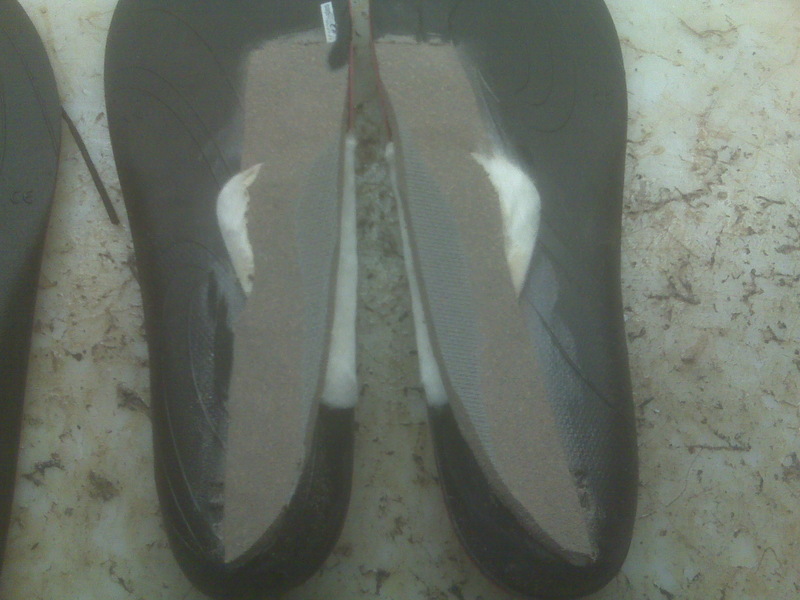 The photo above shows the small Longitudinal Metatarsal Arch Pad being placed in the shoes. I use these for medial arch and metatarsal arch support. You must experiment with the placement so it doesn't increase any pain, and you can thin the felt by peeling in layers or trimming the edges with scissors. They should feel like obnoxious lumps just next to the place of pain, and they do smooth out over time. One pecularity is that I use the right in the left shoe and left one in the right shoe. The curve of the insert seems to match the curve of the shoe better. 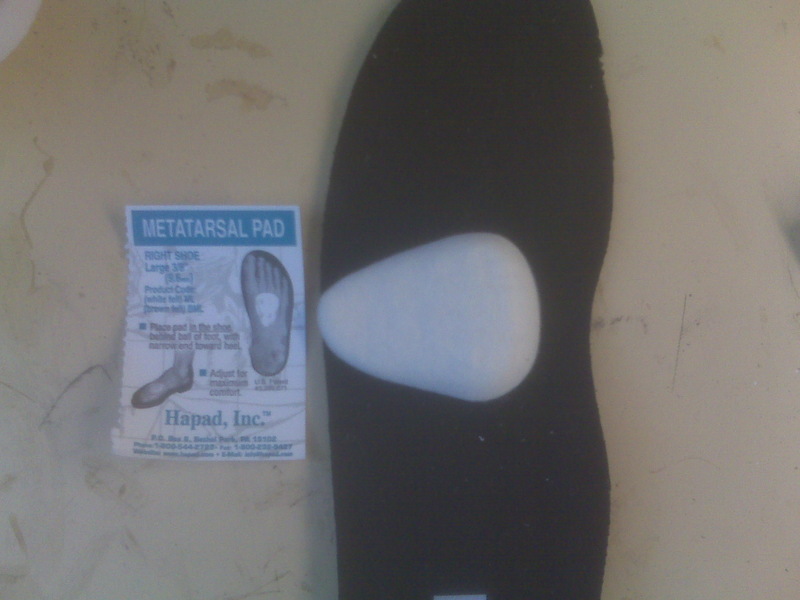 I also place the metatarsal pad perpendicular to the diagram on the package with the thickest part by the second metatarsal and thinnest part by the fifth metatarsal (see photo below). For the Longitudinal Metatarsal Arch Pad I like to place part of the pad so it goes onto the side of the shoe (into the arch better), and not just stay on the bottom of the foot. Of course, this will not work in some ballet slippers, high heels, and sandals. One question I get asked all the time concerns when you are only treating one foot for pain, do you need these inserts in both sides. Technically "no" since you are not placing under the heel or ball of the foot and one side would create a leg length difference. But most patients do feel more balanced when placed into both shoes. I hope this product proves very helpful for you and it has thousands of my patients. • Hold each stretch for 30(minimum) to 60 seconds, and repeat twice. • Alternate between sides while stretching (for example, right achilles with knee straight, then left achilles, then right, then left). • Do not bounce while stretching, hold steady. • Deep breathe to get oxygen into the muscles while stretching. Normally 5 deep breathes equals 30 seconds. • Stretching before exercise should be done after a light warm up, like walking or stationary bike or jog. Julie Cox, PT, recommends pre-activity stretching to be slightly less time (20 to 30 seconds) followed by gentle rythmical motion to warm up the muscle group involved for another 30 seconds. For Example, achilles stretching pre-workout could be followed by a gentle rythmical motion for 30 seconds (back and forth) between raising the heel up off the ground and then lowering the heel back down. • Stretching hard when the muscles are cold (based on weather or time of day) can injure the muscle and gives pre-workout stretching a bad name. • Stretching after a work out is the most important time to gain flexibility since the muscles are heated up.• Stretching before a work out is crucial to preventing many injuries due to tightness, like achilles strain or hamstring pulls. • If one side of your body is tighter, do twice as many stretches on that side versus the looser side. • If you want to gain flexibility, stretch the desired muscle group three times per day, whether you work out or not. • If you want to maintain flexibility, average one time per day stretching the desired muscle group. • Never stretch through pain, it only makes the muscle tighter afterwards. • Most muscle/tendons can be stretched for better results in various positions. For example, when stretching the hamstring, you need to stretch both the upper and lower parts. And especially for the lower hamstring, you can stretch various parts by positioning your foot straight, externally rotated, and then internally rotated. You will feel the pull on the hamstring at different parts. • With many muscle/tendon injuries, if you can find a way to stretch it which relaxes the sore area, you are going to heal much faster. As long as you can stretch without making it painful, you can stretch an injured muscle/tendon 5 to 10 times daily. 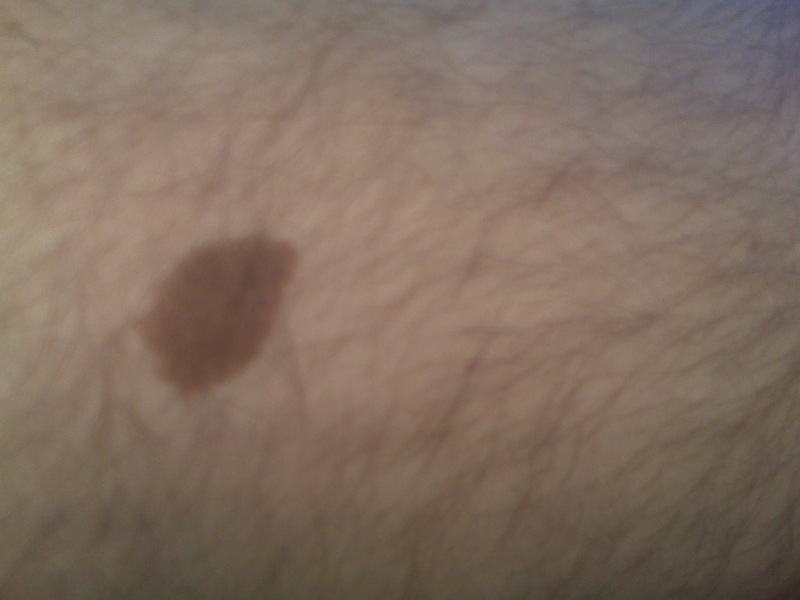 The APMA (American Podiatric Medical Association) has just come out with a new brochure on skin cancers which highlights the need to exam our skin, and those we love, and seek medical advice regarding any skin spots that look unusual, recently developed, very irregular in appearence, and possibly painful. The brochure is an easy read and is downable in a PDF file. At least, it will refresh our zeal for that sun block, but don't forget about your Vitamin D which the sun block blocks. We never win, do we? Many runners present with an interesting dilemma. Their biomechanics demand orthotic devices to control excessive pronation, yet their running on pavement, and present with symptoms which may be related to poor or inadequate shock absorption. 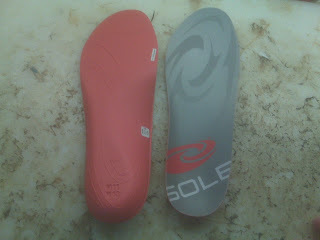 Shock Absorption and Stability seem to be on opposite ends of the insert or shoe spectrum. Yet, I believe I can sum up the problem, and the dilemma of treatment. Running shoes are either cushion (good shock absorption/minimal stability), stability (moderate shock absorption/moderate stability), or motion control (poor to fair shock absorption/excellent stability). And, there are always in between shoes. Functional foot orthotic devices are either cushion/some stability, stability with some cushion, and maximal stability with minimal cushion. Health care providers who recognize this dilemma in prescribing tend to split the difference by ordering a stability shoe with a stability orthotic device. But if I understand statistics alittle, I really only have a 1 in 9 chance at hitting the nail on the head with this approach. So, the prescribing doctor/therapist has nine combinations with these to choose from based on what is the cause of the pain--poor shock absorption, poor stability, or a combination. Because it is easier at times to change shoes than change orthotic devices, I will make my orthotic device on either extreme (maximal stability or maximal shock absorption) based on my best guestimate of cause. Then, I can start with the shoe type I think is the best, but vary based on how the symptoms respond. For example, if I believe I need maximal stability, with little to no shock absorption, I will order a maximal stability orthotic devices with a motion control running shoe. If the patient returns complaining of shock related symptoms (new or old), I can have the patient switch shoes to a more stability or cushion shoe. If I believe initially that they need all Shock Absorption (a runner with knee joint pain with history of knee arthritis), I may start with the Hannaford Device (see previous post) for maximal shock absorption good stability with cushioned shoes. If they need more stability based on their subjective complaints and/or gait evaluation, I can recommend a stability or even motion control shoe. Here are some basic principles in the treatment of athletic injuries. The first priority is to decide on the severity of the problem. The two important categories are major and minor. A major injury needs no guesswork in treatment philosophy. The patient may develop permanent injury if not treated quickly, accurately, and intensely. This is the first type of injury we discussed with the inability to walk, severe and intense pain, etc. Diagnosis is important. Xrays are taken, and MRIs, or other tests are considered quickly. Physical Therapy is initiated. Expense, time, risk of radiation become minor concerns or no concern of all. These, in a way, are easier to initially treat. Cookbook teaching is present for most. Follow the book and success in treatment is usually obtained. It may take months or years to rehabilitate, the patient may never run or ski or dance again, but the doctor is the hero. He/She prevented it from getting worse, taking longer, etc. Hopefully, you are completely cured and can resume all activities. Fortunately, 90 percent do completely recover!!! And, fortunately, less than 5 percent of all injuries are considered in this major category. As the doctor or therapist maps out the proposed treatment plan, it is based on what the majority of patients with the same or similiar problem became better with. Dr Blake tries to point out all the possibilities of diagnosis, cause, and treatment, and then allow the patient to decide how much expense, time and energy he or she wants to build into the rehabilitation plan. Most patients are started on a home exercise program and other self-help ideas (KISS principle). X rays are not routinely performed, with 90 percent of the time the injury limited to soft tissue. Casting is done when walking is difficult, but removable casts are revolutionizing the process. Much less muscle atrophy is seen with removable casts than the traditional permanent casts. Cortisone shots should be limited to only mandatory situations due to their possible weakening effects. Never have tendons injected with long-acting cortisone since possible ruptures can occur. For some, it will seem strange that some patients do not want the "best", fastest care. The problem is that with this "fast" care comes with expense, time, and energy. These are commodities some patients, most patients, are short on. Most of the time we settle on a slower, but still effective, course of action. The patient’s main goal is to rid himself or herself from the problem as soon as possible with no recurrence. The health care provider’s main goal is to safely rid the patient of the problem with no recurrence. Should the patient rest a day, two days, two weeks, three months, etc? Should the patient self treat the problem at home to save expenses, or be seen in therapy daily, weekly, etc? Should an elaborate work-up on the cause be pursued? Should every ache and pain be x rayed, bone scanned, MRI ed, casted, injected, etc? Should every possible cause be treated, even if this would entail months of treatment and huge expenses to the patient? The purpose of these several posts is to bring the patient closer to the doctor/therapist in making decisions on treatment care. It is a joint venture and both must know what the other is thinking. There are a few common athletic injuries in which the doctor or therapist immediately realize that the patient’s problem is very serious. The crack or snap that is heard, the amount of sudden swelling, the severe intense pain, the total inability to walk without pain, the inability to bend a joint without severe pain, the history of years of pain without relief, all signal the doctor/therapist to regard this injury as almost special and definitely serious. Complete investigation should be performed in all of these cases. Fortunately, these are the rare injuries. Definitely, five percent or less of all athletic injuries fall into this category. Most of the time, the injury was gradual, with no to minimal swelling, only moderate aches (level 5 pain at most), with no limping with walking, running, skating, dancing, etc. All body parts are freely movable. The symptoms have existed for 3 months maximum. Should be easy to treat? Sometimes. All those other variables play so much of a role. The doctor or therapist must have basic rules that guide them in their treatment of athletic injuries. A starting place with most injuries develop from there. For each doctor or therapist, these basic rules are very different. Hence, the reason that some are successful at treating sports injuries, others not. But even the best doctor/therapist cannot put all the pieces together all the time for every patient. And, of course, the patient feels let down, misdiagnosed, ripped off, etc. Can this be prevented? Sometimes it can. If the basic trust in the doctor and therapist is there, the patient will communicated his or her frustrations. This forces the health care provider to re-evaluate the course of action and accept failure, change directions, etc. Usually the doctor/therapist is busy treating 1000 patients actively at any one time, all in different stages of healing, without the ability to individually check on the progress of each patient. The patient must follow up, inform if there is no change for the better, and positively help in the healing. There can be physical reasons a treatment regimen fails. We must avoid failure from patient frustrations and lack of communication and distrust in the doctor/therapist and patient relationship. Fortunately, 90% plus of patients get better when communication is free flowing. The treatment of athletic injuries is based on many principles that must be applied to the individual with his/her injury. The experience and knowledge base of the doctor and therapist become very important to the patient. The decisions of diagnosis, cause, when to cast, when to x ray, when to inject, and when to stop all activity must be carefully thought out. 11. multiplicity of the problems, etc. Does this give you a hint of the complexity? The patient is a stranger to the doctor or therapist on the first visit with sometimes a limited amount of time to sense the patient’s problem, frustration, cause or causes, and possible treatment plans, etc. Many decisions are then made. Part 2 tomorrow. Please visit the new website of Honor The Stop for cycling safety, an organization founded by a friend and world renowned triathlete coach Marc Evans. Cycling is relatively safe, and a great exercise, but the rules of the road must be followed. The injuries in cycling can be devastating due to the collisions and the high speeds involved. Honor The Stop helps raise our collective consciousness for road safety. Daily I am awed, inspired, humbled, tearful, and speechless at the stories I hear of the heroes out there among us. One organization of heroes that creates heroes daily in Team In Training. They put on events for the novice and experienced athlete to help raise money for research to fight blood disease which kills someone every 10 minutes in the US. But they raise more than money, they raise heroes. Heroes whose lives are forever changed, as they run, walk, or bike towards a goal. The emphasis is on TEAM. Together Everyone Achieves More. To be part of a winning team is the quest of all of us. Athletics create many opportunities for it. Look what LeBron is trying to create. Parents try to make their families winning teams. Offices try to create winning teams. The old adage is that there is no I in team. A successful team has members that think of the team first, themselves second. I try to team up with my patients to be successful in our treatment. My wife and I team up to try to be successful in raising our boys. Team In Training has been so successful in creating heroes, funding research, and saving lives that they epitomize TEAMWORK. Please look at their website. Hopefully, you will be motivated to join. Perhaps you can share some story. I have treated many of their athletes. They are truly inspirational to me!! Thank you. One of the principles used for breaking in new running shoes is not to go at it "cold turkey", by abandoning one shoe to a newer, sleeker, sexier, model. Most patients, with or without orthotic devices, experience a natural change in the running shoe structure during it's growth from running shoe store to recycle bin/Goodwill. The natural change of a running shoe, except in the worse pronators, is from flat to leaned outward. The photo above shows a running shoe that is slightly leaned outward or slightly supinated. Most runners love a running shoe with 100 to 200 miles of wear, more than a brand new shoe, for three reasons. 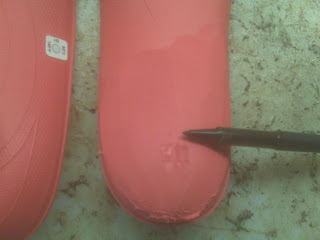 First of all, the upper begins to soften and mold slightly to the runner's foot shape. Secondly, the shoe goes from flatfooted (relative pronation) to slightly supinated (the way most orthotic devices force runners as well as does most motion control shoes). And thirdly, the shoe bends at the ball of the foot better as it softens making it easier to push off the ground (better propulsion). What does this really mean to a runner? I try to encourage runners to purchase another running shoe after 400 miles of wear. This is normally a time that the runner feels great with their shoe mechanics. 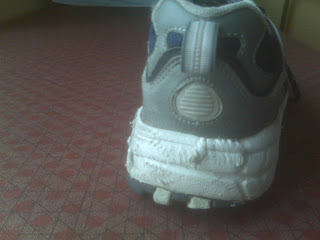 Somewhere between 500 and 700 miles the average runner has worn out their shoe(some even sooner, a few later). But the exact time can vary from shoe to shoe and the warning signs too subtle to notice clearly. By beginning to wear the new shoe for the shorter or easier weekly runs, alternating with the older (more mature) shoe for the longer, harder workouts, it is easier for the runner to know when the older shoe is no longer effective (and perhaps injury producing). Once the new shoe has 100 miles of its own wear, you can begin to wear both shoes on alternate days. When the older shoe finally feels consistently worse than new shoe, it is time to send to an elderly care facility. This scenario can change if you are dealing with an injury which produces pain while running. If you buy a new shoe which produces pain relief noticeable to the more pain producing older pair, common sense says to abandon the older pair immediately. This is a Golden Rule of Foot: If pain is produced in one pair of shoes but not another pair, stick to the pain free pair!! Many runners will experience the opposite (no pain with old shoes, and pain with brand new shoes). If this is reproducible after several short runs, abandon the shoes, bring back to the sports shoe store, or show to the sports medicine health care provider and try to figure out why. If you can not figure out why, and there normally is a good explanation, then you will not know how to pick up another new shoe. It could simply be that the newer shoe is temporarily making you more pronated and, if you want to keep them, you need to walk in them for 2 or 3 weeks before running in them. You may also need an OTC (over the counter) arch support like Your Sole to use in the more pronated newer shoe until it begins to lean slightly into supination. The general rule in breaking in a new pair of running shoes is by beginning to alternate with an older, but not yet worn out, shoe. I hope the advice above will give you a better grasp on this subtle, yet very important injury prevention, task.Good luck!! If you read my post on Tips for Bunion Care you know that I love the product Yoga Toes or one of its many knockoffs. This is my lovely wife displaying her toes. She wears the product as a gentle stretch for her toes 30 minutes daily. It is not meant to wear walking, and you have to moisten the rubber to make it easier to slip on to your toes. Initially, you may only be able to wear it for 5 minutes, then gradually build up the time. It should never hurt. Patients with narrow feet may have trouble fitting the fifth toe (I have had to cut out the partition between the 4th and 5th toes). One of my patients Barbara loved them so much that she brought them for all of her 6 children. It is not the only stretching to do for bunions and hammertoes, but they are definitely a big help!! I love the ease of designing a beneficial insert for my plantar fasciitis patients with the use of Your Sole (or Sole) inserts as the foundation. I tell my patients to get one of the several soft athletic versions. They can go online at http://www.yoursole.com/ to find locations. REI stores generally tend to carry them. The package implies you should heat mold them in the oven, but I prefer patients to try them first and see if the arch is tolerable. The heating process will always flatten the arch support somewhat. The insert tends to last a good year with routine use, but like all OTC (over the counter) inserts, are always in a state of disrepair. The durability of custom made inserts may in the long run be the best option, but this can begin to change the biomechanics for the better with the patient immediately. One of the reasons I like this insert is that it is durable without having plastic. When you are searching for stability, plastic is very appealing, but very difficult to adjust. The photo above shows my grinding the most dense material (hardest) away from the heel area making it softer. The Golden Rule of Foot with Heel Pain/Plantar Fasciitis: The Insert designed should transfer the weight to the arch (borderline obnoxious at times) and float the heel. 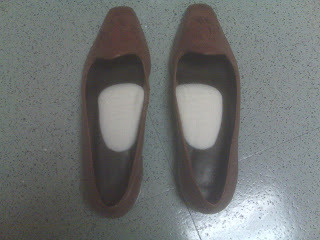 If you look at many of the OTC inserts, they are normally too hard in the heel or not high enough in the arch. If you use this criteria, you may find another insert that works well. The Sole insert just tends to be the most predictable. 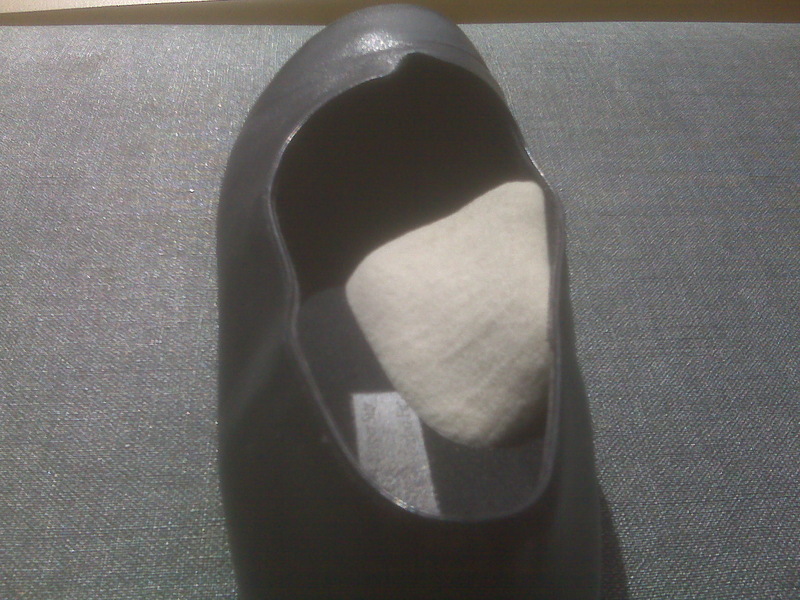 After the heel is ground away of some of its bulk, a softer heel insert can be taped or glued to the bottom. I personnally love Spenco for its cushion and its durability for this purpose. If the arch is not supportive enough (remember my borderline obnoxious comment), another product is excellent for arch support to reinforce the undersurface of the Your Sole insert. I would purchase a small Longitudinal Metatarsal Arch Pad and place it under the arch area as demontrated. You can purchase through http://www.hapad.com/ . It has an adhesive backing and made of fairly thick felt. The felt can be peeled in layers if the full thickness proves too much arch. You can also cut the arch support area out of old shoes and glue/tape under the arch for reinforcement. The blue dot is just a reminder not to put the added arch padding too close to the weight bearing surface of the ball of the foot (first metatarsal head). If the arch support goes too far forward, blisters will occur in the arch as the first metatarsal pushes off the ground against a too bulky support. This is a side view of the Your Sole insole with the Hapad reinforcement to the arch. Here is the top view barely showing the arch reinforcement. Another help if the arch collapse continues (over pronation) is to wedge the bottom (arch side) with some form of durable material. Again old inserts can be used and the material taped or glued on. You should never feel like you are so tilted that you are rolling to the outside (over supination). Here I use a fairly durable cork and rubber composite. 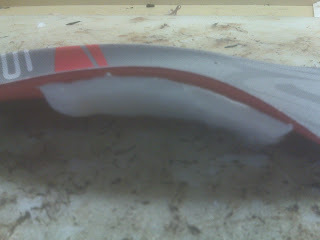 Here is the side view of the arch area with the arch support and the wedging glued underneath. I hope this has been helpful. When you begin to get heel pain, these products can be very helpful in starting you on the road to recovery sooner. You have never run before and have no idea how to start. People who see you run say that you run different in some way (ie. limp, lean to one side, turn ankles in, etc). Running itself for you has always produced a variety of running-related problems. If you look at your shoe wear and shoe insole wear after 300 to 400 miles and find that the wear is very unequal between the two feet. Lean forward slightly at the waist. The straighter you run, the more bouncing up and down you do, and the more excessive jarring on your legs and low back. This moves your center of mass slightly forward to the body, much less stress to the skeletal system. The length of your stride (measured from right heel contact to left heel contact) should be equal to or less than your height. It takes a friend and some trials to measure this of the sidewalk. Try to time right heel contact at one place and have your friend focus on where you land your left heel. A common error is to "overstride" as you try to run faster. Seventeen different running-related injuries are associated with this problem. As you attempt to run faster, focus more on faster leg speed (stride rate) than straight longer strides. You will have to move your hip muscles faster for sure. Your foot should contact the outside of the heel or full-foot first (little toe side). There are some schools of thought that toe running may prove to be better, but I find the foot biomechanics harder to stabilize with toe runners and presently do not recommend it's use. However, if you are a natural toe runner, I would not try to change what comes natural to you. Don't slap or pound your feet along the path. Concentrate on slight gait changes that lessen the jarring. 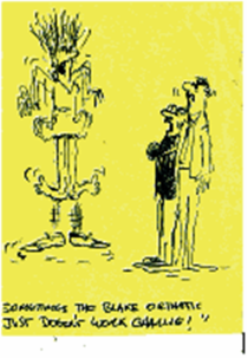 This problem may require better shock absorbing shoes or special inserts made to absorb shock. Relax your fingers, hands, arms, shoulders, neck, and jaw. Relaxing the upper body promotes total relaxation and running efficiency. Carry your arms at a right angle (90 degrees) at the elbows. Make sure both arms are swinging equal (unequal arm swing could indicate a structural problem with your legs). Don't let your arms cross in front of your body or, at least, minimize this action. Running is a straight line progression movement, and side to side motions are counter productive. Relax your wrists, but carry your hands straight with your thumbs up. Take the "Talk Test". If you can talk while jogging, you are running at a comfortable speed. A great source for drug complications is http://www.drug-inquiry.com/ . Athletes should avoid if possible the antibiotic group called the fluorquinolones--Cipro, Levaquin, Avelox, and Tequin to name a few. They have a fairly well documented association with tendon problems including rupture. And these problems can be temporary or permanent. Also, cortisone based drugs, like Flovent, Advair, Prednisone should not be mixed with non-steroidal drugs like motrin, aleve, feldene, etc, which can also can tendon problems. I great source of information is the Pharmacist. Always ask about the risks and contra-indications with other drugs you are taking. It is summer now and the hot weather is upon us. One of the big advances in shoe gear recently is the explosion of fashionable sandals with removable footbeds. 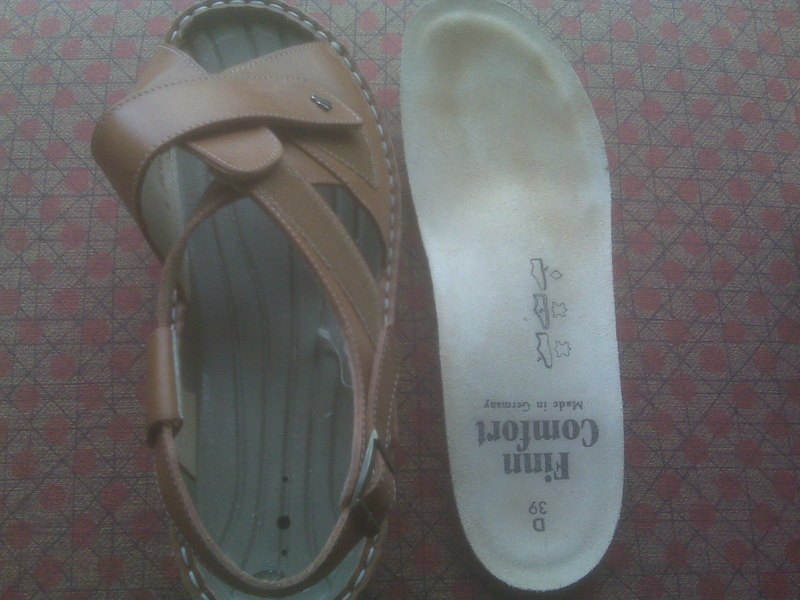 This allows the use of custom made foot orthotic devices to be made for these shoes. The lab needs the sandal and custom foot mold to design an exact fit. No one needs to know you have orthotic devices in the sandals, but hopefully your feet will feel the difference in the support that they provide. 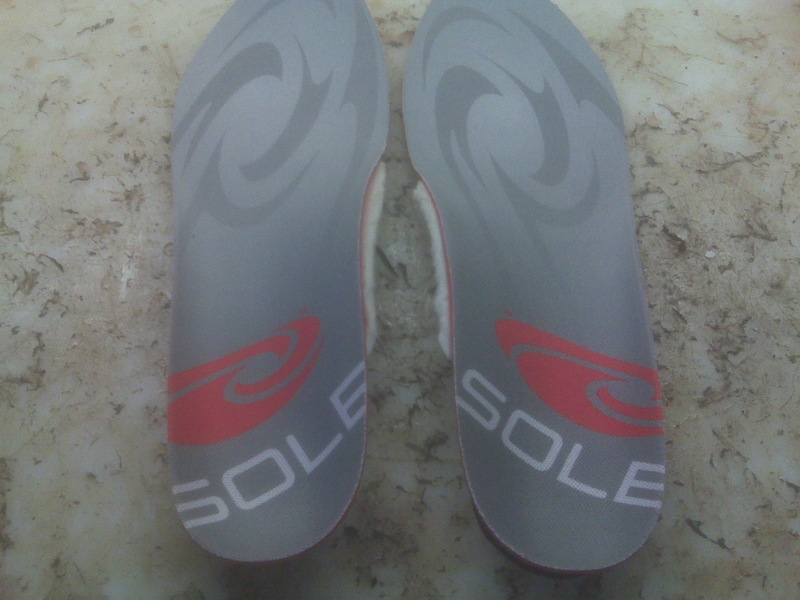 For orthotic wearers, this is a summer must, and an excuse to go to Hawaii in the winter!! 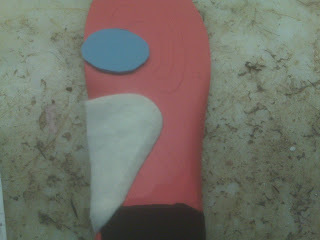 Here is the orthotic device made off the custom foot mold. Here is the Finn Comfort Sandal with the removable footbed removed to make room for the orthotic device. 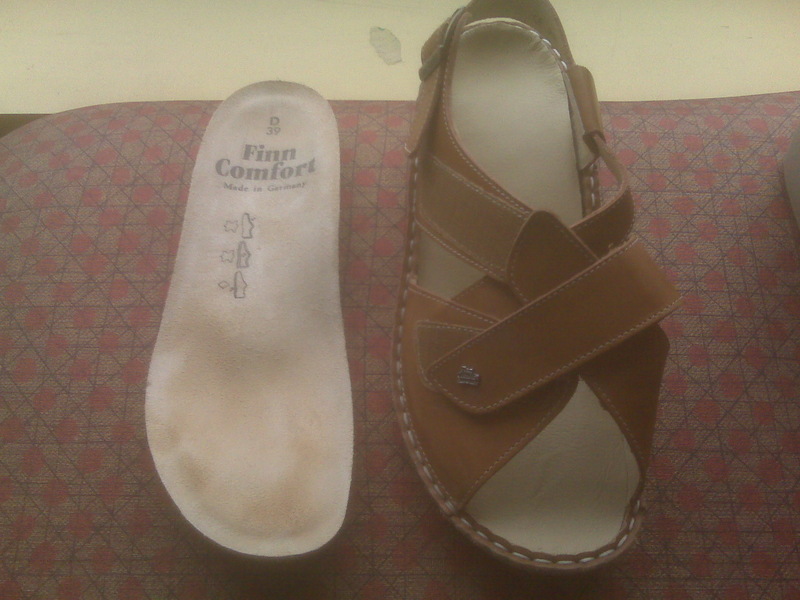 There are many companies that make this type of sandal including (in no particular order): Naot, Finn Comfort, Ecco, North Face, Rockport, Aravon, Bite, Rieker, Drew, Romika, and Aetrex. 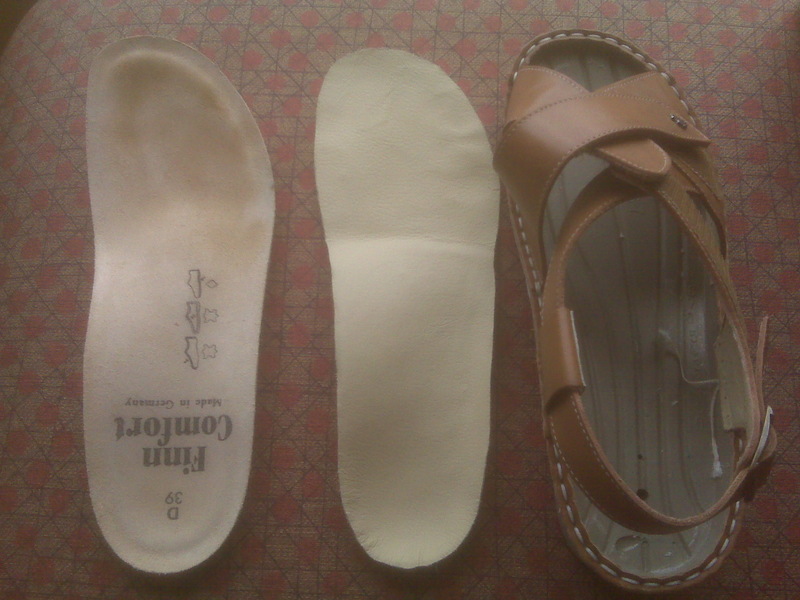 Here is the removable footbed, orthotic device, and sandal. The orthotic device should drop deep into the sandal so it is not visible in the heel area, and the topcover should blend with the color of the sandal. 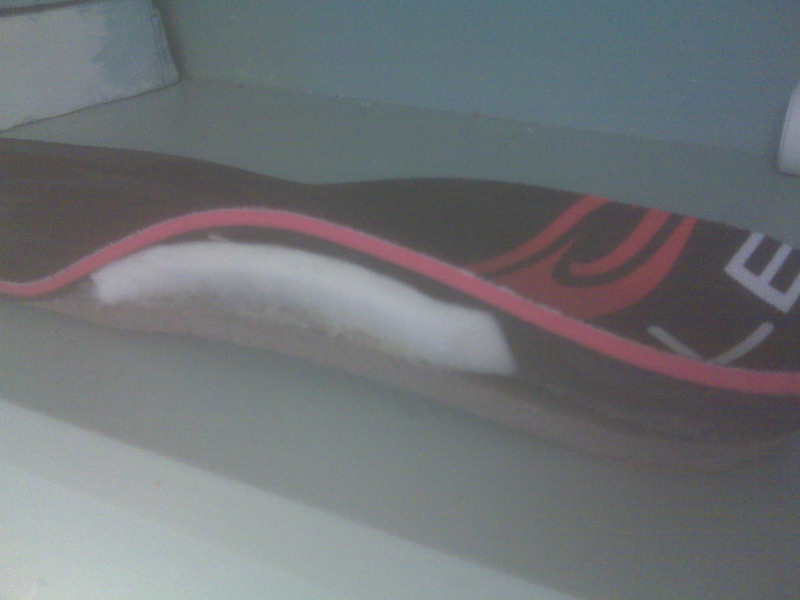 Here is another look at the sandal with orthotic after the removable footbed has been removed. 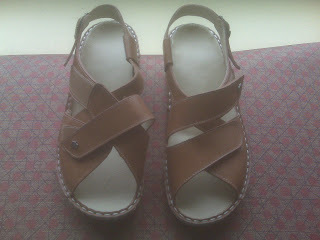 Here is the sandals with unnoticeable custom made orthotic devices. Many patients with biomechanical problems have now been able to wear sandals for the first time in years due to this technology. I hope it can help some of you. I am currently reviewing the history of an orthotic device I designed in the 1980's, but continue to work on to this day. I will copy and paste the posts on this website called "Podiatry Arena". I use the technique approximately 1/3rd of the time, so if you are my patient, you may have such a device. I am not sure what the interest will be on this blog, but I do want to keep my cyberspace contributions under one roof right now. I am honored to be asked by Kevin (Dr Kirby) to address the history of the Inverted Orthotic Technique. Due to my time restraints at present, I hope I can gradually tell the story over the next week. Someone may have to help me find this thread again, as I am just beginning to use this wonderful forum. It was 1981 that I started at the Center For Sports Medicine at Saint Francis Memorial Hospital in San Francisco. I had just finished my two year residency, the 2nd year as a Fellow in Biomechanics under Dr Ronald Valmassy and Dr Chris Smith. Dr Kirby was a sophomore during my 2nd year, and I stayed on teaching at the California College of Podiatric Medicine for the next 11 years. When I started at Saint Francis Hospital, I was hired by Dr James Garrick (who is still my boss 29 years later). The sports center was an orthopedic clinic, and I was the first podiatrist. Patients can in flocking in not to see me, but to see the famous Dr James Garrick for their knee injuries. Dr Garrick had started in 1968 the first sports medicine clinic within a medical school at the University of Washington. Dr Garrick was/is tenacious about only operating after all conservative treatment was tried. He loved podiatry, and my first year was filled with knee injury after knee injury. I came to Saint Francis armed and fully trained with classic Root/Weed knowledge. I ended up spending 10 years studying under Dr John Weed, and worked closely with Dr Merton Root on my original paper the Blake Inverted Orthosis. It was my frustration with helping one particular patient in the fall of 1981, that I began experimenting with positive cast inverted positions that were then considered radical. In my next post, if you allow me, I will go from here. As I discussed in Part I, I started at the Center For Sports Medicine armed with Root/Weed Biomechanics ready to conquer the world. My first few months in the fall of 1981 met with a few challenges, but most patients fell within the biomechanics controlled with Root Balanced Orthotic Devices. Then, Patient X was referred to me by Dr James Garrick to help control his foot pronation and hopefully delay or eliminate the need for a knee replacement. A left lateral tibial plafond fracture with collapsed lateral joint line placed his knee in marked valgus with a strong pronatory force on the foot. His whole knee was swollen, but his symptoms remained lateral joint line. As I began attempting to change his biomechanics, he was also in physio and experimenting with various ineffective knee braces. His resting calcaneal stance position was 8 deg evertd left, and 0 or vertical right. Since I had only several experiences with partially compensated rearfoot varus patients needing a 4 degree inverted pour, and Dr Root taught never to invert the cast more than 5 degrees or lateral instability would ensue, I decided to pour the casts 4 inverted left, perpendicular right. All my rearfoot posts in those days were 4 deg inverted with 4 deg pronatory motion. So, I fully expected at least 50% reduction in the pronation and symptoms. Part II showed that my suspected 50% correction of the severe pronation on his left foot with a 4 degree inverted orthotic device proved to be an utter failure. But I was so indocturnated with Root/Weed biomechanics that I then attempted a 6 degree inverted cant/pour. Again, a total failure in controlling the extreme pronation caused primarily by his acquired genu valgum force. I then proceeded to make a series of orthotic devices in 2 degree increments not knowing any way of predicting how much supinatory force I was needing to apply. He would come in every week on Friday for a new and possibly improved left orthotic device (in those days I was only working Fridays at Saint Francis). I again had complete failure at 10 degrees inverted and 12 degrees inverted. At 10 degrees inverted his arch became sore as he tried to get used to it with the radical arch support as his knee drove the pronation downward collapsing the arch. The pronation was still winning, although the pronation was becoming less noticeable in gait. He was no longer worse with the orthotic device, but he was only slightly better. And his knee still hurt just as much. It was when he came in to get the 12 degree inverted orthotic device that he told me the 10 degree inverted device really was hurting his arch. And here I had an even higher arch to give him. Oh boy!! As I examined his foot, it was really obvious that it was the medial slip of the plantar fascia that was getting sore. I ground the orthotic device along the sore area (can not remember if I marked his foot then like we do now with a non permanent magic marker) making a nice temporary PF groove. With rohadur this weakens the plastic, so I knew it was temporary. He instantly felt so much better. For the next 10 years, until I transitioned to polypropylene, plantar fascial grooves were placed on all of my inverted orthotic devices routinely--whether the patient needed them or not. I never dispensed the initial 12 inverted device without a groove, but the next week I designed a 12 degree inverted device with a PF groove already built in. The first of thousands of inverted orthotic devices with PF grooves. I will talk about PF grooves and the continual saga of the first inverted orthotic device success in later posts. Thank you. In the initial 3 posts on the History of the Inverted Orthotic Technique, I reviewed the first patient I had that pushed the limit of Root/Weed biomechanics. I had designed a 12 degree inverted orthotic device with a PF groove to prevent arch irritation for severe acquired genu valgum and knee pain and collapsed arches. But the pronation was barely being affected. Our training said if you place a patient in a 12 degree inverted orthotic that they would function 12 degrees inverted temporarily until they sprained their ankle. This patient however had an extrinsic cause of pronation, a force I learned was much more difficult to control. I had learned that extrinsic forces were harder to treat than intrinsic forces. And I had learned that frontal plane forces were easier to treat than sagittal or transverse plane forces. But, there had never been any quantification of the correction needed. It would take me 2 years of studying these forces to determine the force correction was somewhere between 3 to 8 times greater than simple intrinsic frontal plane forces (while I waited for Dr Kirby to graduate). What a ride I was in for!! More on this to come!! But, yet I digress. Patient X failed at 12 degrees inversion, but I could see some gait improvement. Patient X failed at 14 degrees inversion, but at 16 degrees definite pronation stability was being changed and symptomatically the patient was feeling better. 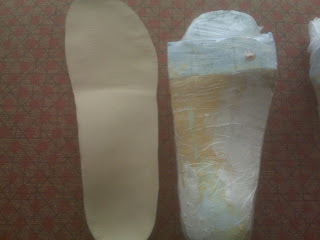 I only made 3 more left orthotics for this patient. The 20 degree inverted orthotic device with PF groove controlled the patient over 80%. The 24 degree inverted orthotic device with PF groove controlled the pronation 90-95% but was too uncomfortable to a misfitting groove. I decided to recast the patient and remark the PF and made a more comfortable 24 degree inverted orthotic device. At 20 degrees the knee stopped swelling, and at 24 degrees the knee pain was mild, and function was much better. The correction of Patient X proved to be a 3 to 1 ratio, it took 24 degree correction to change the RCSP from 8 everted to vertical. This correction was also influenced by his knee bracing and high top boots we were using. The correction was probably more 4 or 5 to 1. Part V will begin to explore the journey with Root Lab, the podiatry profession, Kevin's skive revelation, etc. Hope you will stay tuned. In my previous posts I explained the situation around the first inverted orthotic device of 24 degrees inverted with 4.0 Rohadur and a PF groove to prevent arch irritation. This was December of 1981. The patient's knee symptoms had improved and I was excited about the findings. It would 2 more years until I gave my first local presentation on the technique as I began to discover what patients needed more correction than typical Root/Weed biomechanics had to offer. During those days, I spent time almost weekly learning from Dr John Weed. He was only 45 minutes down the road from San Francisco, and was the smartest human I had ever talked to. I would bring patients routinely down to his office in the early 1980s to discuss their orthotics, whether they needed surgery, etc. But in Dec 1981, I called John and asked if I could talk to him about Patient X and my discovery. So, I drove to San Jose excited about discussing my findings. I had also had 2 or 3 other patients that I had used 12 to 16 degrees of inversion with good results, so I knew it had some merit. With sports medicine, varus wedges were routine to help runners slow pronation, but these were never more than 4 degrees or less. My conversation with John Weed was disheartening. He was my mentor, and was not impressed, I could tell he didn't understand how my claims were possible. He sent me over the Root Orthotic Laboratory, which was next door to his office in those days, to explain what I was doing to Jeff Root and Elaine Root (office manager ---can not remember exactly if she had married Mert by then). They immediately had Mert Root on the phone with me. Now, Mert Root was a god-like figure. I was in awe of him. What he had done, and what his influence on the world of biomechanics continues to do, made every one uneasy. He was on a different plain of consciousness in biomechanics. And now I was going to actually talk to him. He kindly listened to my excited recourse of the events of the first 24 degree inverted orthotic device and that I was beginning to take some of the theories learned and use on other patients. He spoken for a few minutes, but I only remember the phrase--"they will never work, and they will cripple those you give them to." I was devastated!! The response I got at the California College of Podiatric Medicine, Department of Biomechanics, where I taught until 1992, was of uninterest. Nothing these leaders of Biomechanics were excited about. So, I continued to make and learn and remake hundreds of these orthotic devices in 1982 and 1983 without the support of my colleagues. My students, Dr Kirby, Dr Fettig, Dr Christiansen, Dr Hannaford, Dr Denton were my friends and sounding boards. More on their influences on me later. It was a patient I saw with John Weed in late 1982, that began to change his mind, and then Dr Roots. Dr Merton Root became by greatest supporter by middle of 1983. Many athletes use treadmills for the majority of their running. I want to give those who are new to treadmill running, and those use the treadmill for workouts 5 plus days/week, some words of caution. First of all, it takes many hours of treadmill running to develop a smooth gait. This is why running research done on treadmills is normally closely scrutinized. Your first 50 to 100 hours of treadmill running can be biomechanically erratic. This is not true for normal ground running where the biomechanics are more predictable (but harder to video while doing research). As you run on a treadmill, each step passes through the "double float phase". That means both feet are off the ground. As you land one foot on the moving treadmill surface, the treadmill belt is either moving at your same speed, faster than you, or slower than you. It is the later two circumstances that can cause problems. If the belt is moving slower than you, the belt will try to decelerate your speed (put the brakes on), and your leg will feel the impact shock. If the belt is moving faster than you, the belt will try to accelerate your speed (move you along), and the foot and leg will be torqued or twisted as it is pulled abnormally on the belt. This is normally with an increase in foot and ankle over pronation. Even experienced treadmill users have this problem due to the daily variation of how tired their muscles are. I know as I age, I am more unsteady on the treadmill, partly because I have my ipod going or straining to watch the TV monitor in front of me and I am too tall, and partly because I am getting older. I use the treadmill only sporatically on vacations, during the rainy season, or while I wait for my basketball game to begin. I, and all the erratic treadmill users like myself, need to be very careful to stay focused. The treadmill is inherently unstable, and when you add instability from another source or two, trouble is brewing. Many feel the treadmill is a problem since it affects an athlete's natural stride. I can image that tall runners have more of a problem with this. The Golden Rule of Foot: Try to find your normal stride on a treadmill. If not, abandon it as a form of exercise. If you can run outside also, use the treadmill only 50% of your running (try to run outside every other workout if possible). Most runners modify this with treadmill during the work week, and outside on the weekends (days off). If you have any pain during or after running, try to analyze if it is worse running treadmill or outside. If obvious, try to emphasize the least painful environment. Understand that treadmill running can affect your biomechanics and you must stay focused on form, smoothness, and the onset of pain. The pain may more be related to the treadmill than the running itself. If you have any symptoms from running on the treadmill, even if minor, make sure that you keep the level at 0. Any elevation can increase the stress on many structures, including the achilles tendon. If you have no problems running on the treadmill, and have been doing it for years, still consider cross training by doing some running outside (slightly better impact for bone development). When you are tired, after a long day or a late night before, treadmill running will definitely produce the most biomechanical problems for you. Consider cross training with the ellyptical or stationary bike. I hope this makes you think with alittle more caution about treadmills. Marc's comment on heel strike causing problems is definitely worth noting. I have found the most smooth and effective running styles involve full foot strike or fore foot strike, not heel strike. When you land at your heel hard, too many problems can arise. For years, cross country and track coachs have known to minimize over striding as a way of running faster. You can run faster by either lengthening your stride (emphasizing harder heel strike) or by increasing stride rate (moving your muscles faster and more efficient). Over the last 10 years or so, I have heard more and more patients told to emphasize in gait a heel to toe motion. Supposedly, this makes a smoother, less jarring gait to ease the stress on your muscles, tendons, and joints. But, this is very hard to learn, and not necessarily the best for most patients. I prefer a solid full foot or forefoot land, based on you speed of walking and a de-emphasis on heel strike. For 5 years our clinic did video analysis on our biomechanical patients, both walking and running. The running gait cycle was so much smoother than the walking cycle. I felt it was the elimination of heel strike in running that smoothed the gait out. Smoother gait should mean less stress on the body overall. So I think some running shoes if they force unusual heel strikes because of their heel lifts or their out flares or their outersole bumps should not be used. The athlete, with the help of the running shoe store, and perhaps with the help of the personal trainor, coach, health care provider, should make sure the gait is smooth. At least in the big cities, it is common practice for running shoe store personel to be runners, and to watch the athletes run to check for this before purchasing a shoe. As podiatrists, we look at people with very weak structural feet everyday. These feet can/may be helped with a progressive foot strengthening program over the course of 2 to 3 years, if they choose to spend that effort. I find this the hardest part of rehab, restrengthening, since patients normally don't hurt much in this phase. The motivation goes out the window. And this will only help some. Many patients with weak foot structure, very sensitive nervous system, loose ligaments, auto-immune deficiencies, to name a few, would have their feet ruined by attempting to run/walk without good shoe protection. Unfortunately, I have seen too many patients injure themselves so far that there is permanent damage. No health care provider would ever want to take that risk with their patients. Therefore, this minimalist shoes/barefoot trends will never get a medical endorsement. Make sure your shoes allow you to run smoothly. Work with experts to insure your gait is smooth. Do not emphasize a heel to toe walk/run, land more flat footed for stability. Change your gait pattern gradually, and only if you are forced because of injury. It is a very hard process to accomplish. If you wear motion control or stability shoes, and orthotic devices, make sure that 3 times a week you are doing a foot/ankle strengthening regimen. The regimen should be progressive from month to month to make sure you gradually get stronger feet and ankles. If you have strong feet, no history of any problems in feet, ankles, knees, hips, or low back, and you decide to run barefoot or with minimalist shoes like Vibram Five Fingers, progress very slowly, and listen to your body. Choose soft safe surfaces. Get the advice from a running coach on how to start slow, and then go even slower and shorter. If you develop pain with any new trend, stop immediately, make sure the pain has resolved, and think extra hard if this is really worth the risk. I would like to introduce you all to the Hannaford Orthotic Device. Dr David Hannaford from San Rafael California introduced it into the profession of podiatry in the 1980s after years of treating athletes. For this, I owe Dr Hannaford a long overdue Thank you!!! It is the best orthotic device on the market for many conditions needing cushion and support. The top layer is memory foam, and the subsequent layers give some structure and durability. If you have chronic heel pain, chronic stress factors, chronic knee or hip joint pain, and wear shoes that can accommodate a bulky orthotic device, this is the orthotic device to try. It is a product unfortunately not made by any orthotic labs, but can be easily learned. I make them for my patients, and for the doctors in our clinic patients. There is a slight learning curve when using them, but their use must be increased. I will try to expand it's use through this blog. I will try to encourage my patients with this device to comment on the device and what it has done for them. Any mold impression of the foot can be used to manufacture this device. As the memory form compresses for the first 30 hours of wear, the device actually gets alot better. The photo below does no justice to its effectiveness. It is a temporary orthotic device lasting one year, but many patients choose it as their permanent orthosis with yearly remakes. The material used is 1/2" plastazote with the soft orange against the skin and the more supportive on the ground. The 2 layers are glued together before pressing. A vacuum press is used to press around a mold of the foot under high pressure and allowed to cool in shape. The material is removed from the mold and excess material cut off with scissors before the grinding process begins. The grinding process takes a little time to learn, but any lab or doctor could learn the 10 plus steps fairly easily if they want to learn. After the grinding is complete, a leather topcover is applied after gluing both surfaces. The leather allows the clinician to check the wear pattern on follow up visits. I sure hope if you need a Hannaford Orthotic Device for maximal shock absorption for chronic stress fractures, chronic heel pain, knee or hip arthritis, this post will allow you to get the device easier. I have seen hundreds of types of orthotic devices, and never seen a device that works so well when maximal shock absorption is needed.